We are pleased to present a parent and child joint exhibition. Mr. Kozen Hanyu (93) is the oldest carver in active service, specialized in making Noh-masks of Kanze School Ms. Emiko Horimoto, his daughter is a worldwide artist of paintings presenting “Ｍｅｓｓａｇｅ ｏｆ Universal Love“. 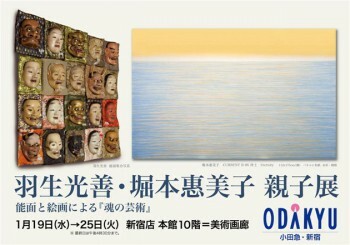 We hope you will enjoy “World of Soul” presented by Noh-masks and paintings. Exhibited are about 20 pieces of Noh-masks and about 30 paintings including a large one of folding screen type. 1917 Born in Asakusa, Tokyo as the 3rd son of Mitsunaga Hanyu. Started carving Noh-masks at the age of 15 and has kept on carving for 78 years. 2008 Had an exhibition “Contemporary Artists of Noh and Kyogen” at The　Theatre Museum of Waseda Univ. Graduated from Tokyo Woman’s Christian Univ. Studied in Art School of Musashino Art Univ. the Embassy of Japan in Finland, Saku Municipal Museum of Modern (Nagano Pref..), Tamashin Historical Museum (Tokyo), National Cancer Center, East Hospital (Chiba Pref. ), Tokyo Woman’s Christian Univ. (Tokyo)., etc. Horimoto will attend every day. Hanyu will attend January 19th, 22nd and 23rd.